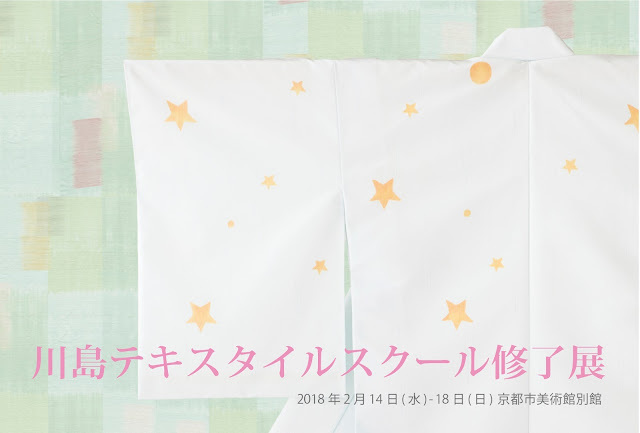 Kawashima Textile School will be closed for Spring vacation from March 15 to 31. We will respond to your emails after April 1. This year's Graduate Exhibition will be held from March 6 (Wed) to 10 (Sun) at the Special Exhibition Hall on floor B1 at Miyako Messe. We will be exhibiting pieces by our first and second year students, technical study course students, and international students. People who are touching upon weaving for the first time learn the general foundations of dyeing and weaving over 11 days. 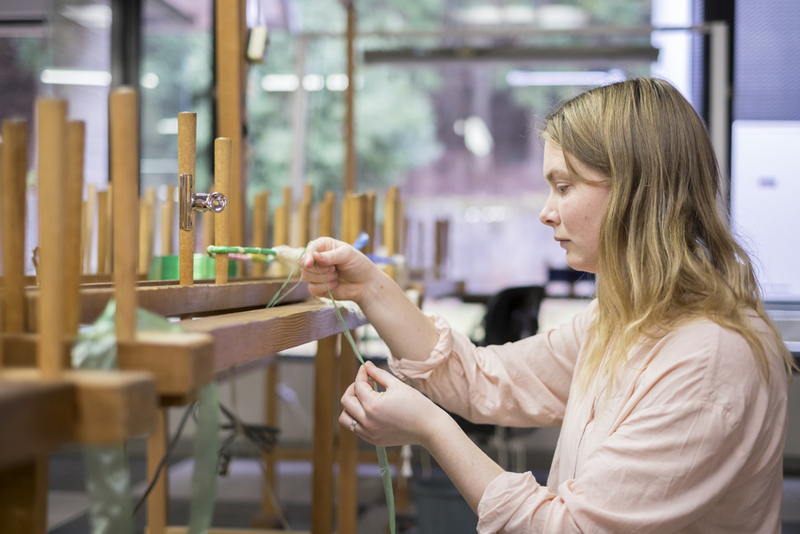 Through making samples, gain an understanding of the mechanism of a basic floor loom, and learn about the structures of plain weave, twill weave, satin weave and more. More information about the course and application procedure can be found here. Please use our contact form if you have any questions. 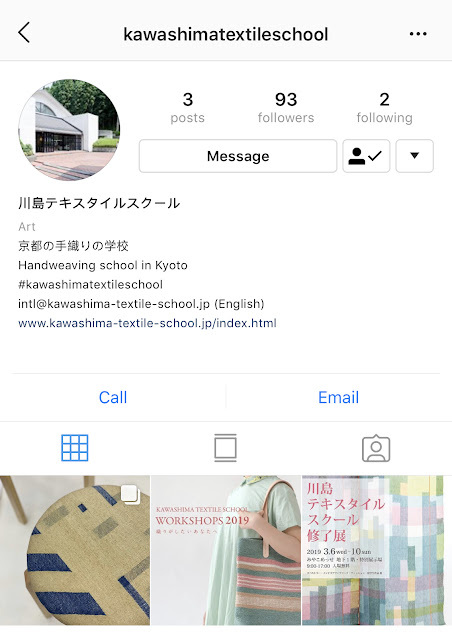 There have been some problems with our server, and emails sent to addresses ending with @kawashima-textile-school.jp may have not been received. We kindly ask you to re-send any emails sent during the following period: Dec 5 (Wed) 17:40 - Dec 10 (Mon) AM Thank you for your cooperation. More information about the course and application procedure can be found here. This year's Graduate Exhibition will be held from February 14 (Wed) to 18 (Sun) 2018 at the Annex of Kyoto Municipal Museum of Art. We will be exhibiting pieces by our first, second and third year students, technical study course students, and international students. My trip to Japan started in Okinawa. 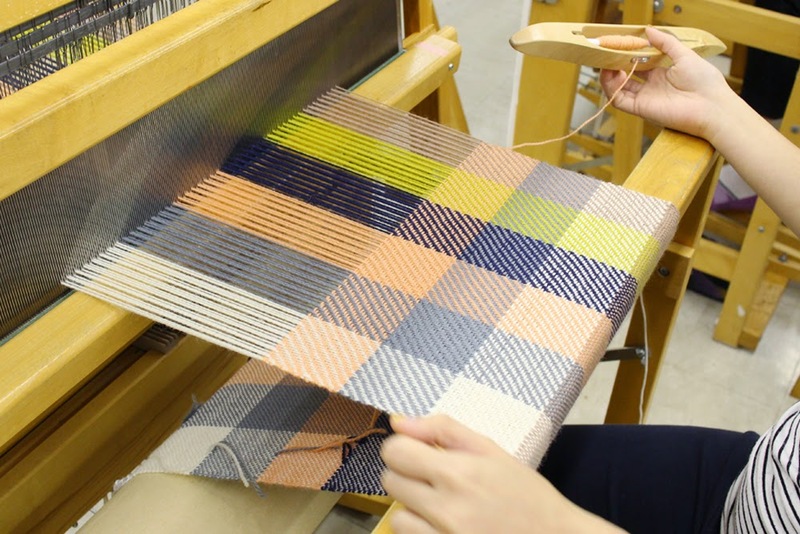 The very first day in Naha, I went to a weaving center, and was able to see Japanese looms and even try them myself. I didn’t try Kasuri, but I saw it and was very fascinated. The hardest part was to do the bindings tight enough. “A little bit tighter,” my fingers were all numb. When the binding was all done, we dyed with Hori-sensei. It was such a nice and well-organized dyeing room. After four weeks, I understood the basics of Warp Kasuri, Weft Kasuri, Zurashi Gasuri and Nassen Gasuri. For the last four weeks, I worked on my own project. I wanted to use different materials from what I use at home, and decided to use ramie and silk. 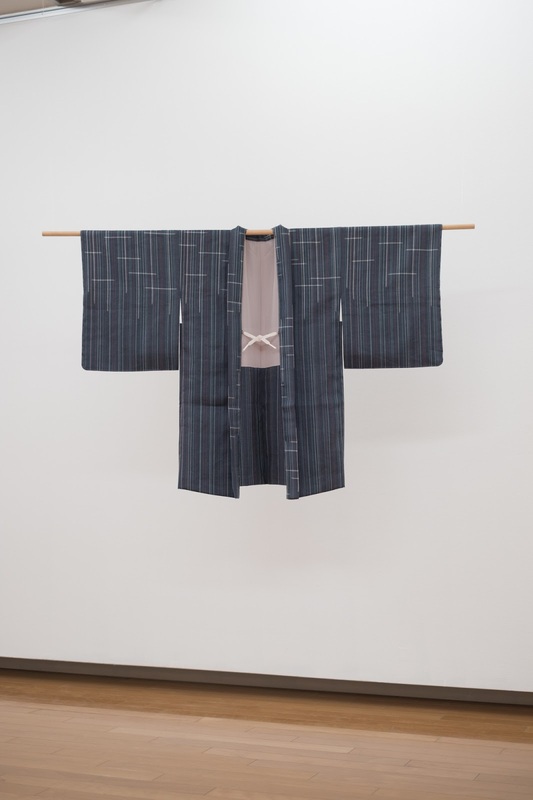 Since I have always liked clothing, naturally I thought of a kimono, while in Japan. But there was not enough time. Maybe I can do a little bit less, a Haori (jacket). My teacher, Yamamoto-sensei, helped me to get it all started. Even if we do not have a common language, we could communicate between the threads. 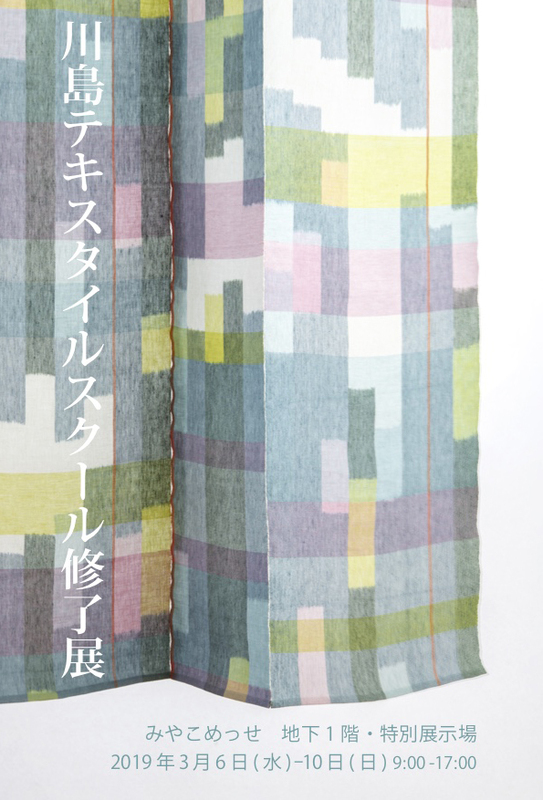 To weave on a Japanese loom, where everything is loose, is quite different from a Swedish Öxabäck loom. I was taught how to use three shuttles at the same time, to get a uniform fabric. Together with Emma-san, I went to a tailor to leave my own fabric, which I have worked so many hours with. – Please make me a Haori. I was so lucky that I had a translator – Emma-san. At the end of the year I went back home to Sweden. After a couple of weeks I got to know that the Haori was ready. I was very curious about what it looked like. From the exhibition I got a few photos of the Haori and all the other nice textiles by the students. But I did not actually see the Haori until one day in April. A flat package arrived from Japan. When I unfolded it I was quite nervous, but it looked even better in real life. Now it hangs on a wall in my house to look at every day, and I am really proud. I am looking for a good moment to wear it, but it has not appeared yet. Maybe I have to go back to Japan for a suitable situation. Apart from weaving, my best memory from Kawashima Textile School is the afternoons: the question hour between four and five. Since I stayed in a room outside the school, I had to cook my own food for breakfast and dinner. It was very interesting, and there were so many new things to try. Vegetables, fruit, fish, and packages I have never seen before. Nearly every day I had new questions about food and recipes. How to cook tofu, all different kinds. And what is the best natto. Thank you all teachers in the teachers’ office, for so many pieces of good advice. A special thanks to Kazumi-san, always doing a little bit extra and searching for interesting things to do and see. 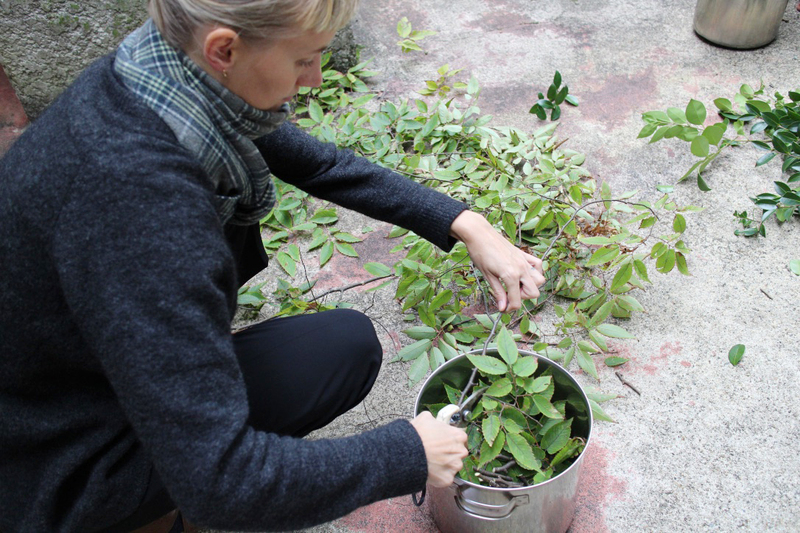 Katarina was an exchange student from HV Skola (Sweden) and studied in the Foundation Kasuri Course and Applied Kasuri Course I to III in autumn 2016.